This structure contains most locations needed for by an OMPVarListClause. Definition at line 160 of file OpenMPClause.h. Definition at line 168 of file OpenMPClause.h. Ending location of the clause. Definition at line 166 of file OpenMPClause.h. Definition at line 164 of file OpenMPClause.h. Starting location of the clause (the clause keyword). Definition at line 162 of file OpenMPClause.h. 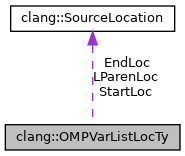 Referenced by clang::Sema::ActOnOpenMPFromClause(), clang::Sema::ActOnOpenMPMapClause(), clang::Sema::ActOnOpenMPToClause(), and clang::Sema::ActOnOpenMPVarListClause().